Mrs. Hopewell in Flannery O’Connor’s “Good Country People”; Sethe in Toni Morrison’s Beloved; Suyuan Woo, Lindo Jong, An-mei Hsu and Ying-ying St. Clair in Amy Tan’s The Joy Luck Club: literature provides countless examples of this family member who fills such a crucial role in our lives. From the classics—Gertrude in Hamlet—to the contemporary—Mrs. Iselin in Richard Condon’s The Manchurian Candidate—some literary mothers offer unflattering illustrations. The Bible, however, presents positive role models. Jochebed made her heartrending choice to save her baby Moses’ life. St. Anne shared an uncommon bond with her daughter, Mary the mother of Jesus. 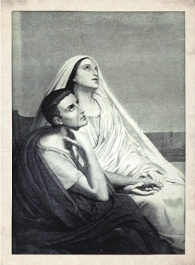 And our University’s patron saint, Augustine, had an exceptional mother: St. Monica. Her faith and her persistent dedication to her son convey a profound influence, as described in Augustine’s Confessions. Has a mother from literature influenced you? Do you find any literary mothers particularly memorable? Please contribute your suggestions in our “comments” section.